The objective of the game is to complete 20 tasks/rooms, which will perfectly test your physical strength, mental endurance, logical thinking, communication skills and team spirit. It's not necessary to complete all tasks as the primary goal is to have good fun together. Our game is not about individuals, you have to work together when completing each task. Each challenge is always performed in a team of 3 to 5 players. To tackle all the tasks you need an average of 2-3 hours, depending only on the skill of your team. The objective of the game is to complete the various tasks which await you in 24 rooms. We have prepared for you multiple levels of dificulty, so the whole team can have fun no matter your fitness level or age. Remember that the rule that applies here is "the bigger the team the better the fun"
We have prepared games for you that will test your dexterity, speed and strength. However, you have to remember the basic safety rules when playing. Entry is at your own risk. The games comply with safety standards guaranteed by the TÜV certificate, however, we recommend not overestimating your abilities. Consider whether your medical condition allows you to participate in the games. Tasks to transfer your own weight or loads weighing up to 5 kg. Use sportswear and sturdy sports shoes in the game area. Do not damage the equipment. Do not use brute force to complete the tasks; rather, use cooperation, wit and dexterity. Minors are the responsibility of their legal guardian. Do not enter the game area under the influence of alcohol. It is prohibited to enter the game area with food. It is prohibited to bring glass objects, such as glasses, into the game area. Keep valuable objects in dedicated areas. The operator is not responsible for their loss or damage. Follow the instructions of service staff. Team Up is ideal for company events, team building, fun with friends, a family trip, an unusual party, school trips and basically for all people who want to have fun. Team up is perfect for Bday party celebration. 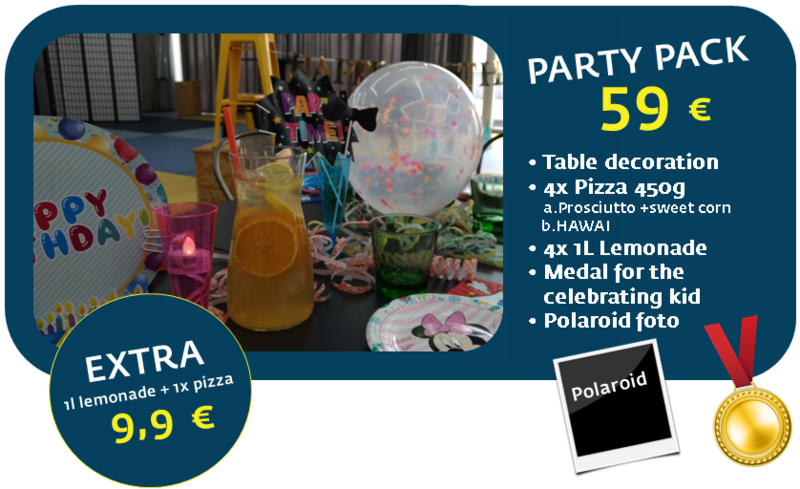 If you need party decoration on the table or pizza we have prepared for you "Party pack"
Ordering Party pack is easy. When you create reservation type into the note field "i would like to order Party pack Hawai" If you require extra pizza and lemonade type into the note field " party pack hawai + extra prosciutto"
When you arrive , table with decoration will be waiting for you. Pizza will be ready after the game. If there will be sudden change in count of the players no worries. You can add or remove extra pizza when you arrive. How old kids can play the game? For kids bellow 10 years - We advice that at least one member of the team is adult. Some task might be dificult to understand for the kids and they will not be able to enjoy the game fully. Team up is best for spending fun time with friends, Bachelor parties or birthday parties. Minimum number of players is 3. Booking is easy, set your date and time via the link below. Team Up will prepare a perfect team building exercise for you, something that your employees have never experienced before. Are they bored? Do they think they've been everywhere and seen everything? Are they lacking motivation? Bring them to us! 1800 m2 of space designed for the ideal team building. Mutiple levels of difficulty based on your team. Complete walktrough the company event from arrival till the end can be found on our blog HERE. Price of the game is calculated by minutes spent in the game. *FAmily weekend price is valid on weekend or bank holiday for team consisting of minimum 1 and maximum 2 adult players. *Minimum number of players in one team is 3. Maximum is 5. Team Up will prepare a perfect team building exercise for you, something that your employees have never experienced before. You will find us in shopping center STYLA nearby the lake "Zlaté piesky"
Use the elevators by the "entrance A"
How can yu get to us?